G.N. Ramachandran, an outstanding figure in the field of protein structure, passed away at the age of 78, on April 7, 2001, in Chennai (the erstwhile city of Madras), India. Ramachandran (G.N.R. or Ram to his friends and associates) was the founder of the 'Madras' school of conformational analysis of biopolymers. His discovery of the triple helical structure of collagen in 1955 and his analysis of the allowed conformations of proteins through the use of the 'Ramachandran plot' rank among the most outstanding contributions in structural biology, along with Pauling's description of the α-helix and Watson and Crick's discovery of the double helical structure of DNA. G.N. Ramachandran ('G' stands for Gopalasamudram, his native town, and 'N' stands for Narayana Iyer, the name of his father) was born on October 8, 1922, in a small town not far from Cochin on the southwestern coast of India. His father was a Professor of Mathematics at a local college and thus had considerable influence in shaping Ram's interest in mathematics. After completing his school years, Ramachandran graduated in 1942 as the top-ranking student in the B.Sc. (Honors) Physics course of the University of Madras. In 1942, Ramachandran joined the Master's program in Electrical Engineering at the Indian Institute of Science at Bangalore but was soon brought into the Physics stream by the head of the Physics Department, Sir C.V. Raman, who was awarded the 1930 Nobel Prize in Physics for his discovery of the Raman effect. (Until Raman discovered this effect, it was generally believed that scattered light can have its frequency shifted only towards the red end of the spectrum, towards lesser energy. Raman discovered shifts in the frequency of scattered light towards the blue end of the spectrum, towards greater energy, violating common sense and conventional wisdom. Ramans discovery was one of the important tools that dethroned the deterministic world of classical physics and launched the probabilistic world of quantum physics.) Under the guidance of Raman, Ramachandran continued in Physics, did his post-graduate research in the areas of optics and X-ray topography of diamonds, and obtained a D.Sc. degree in 1947. This degree is equivalent to a Ph.D., the difference being that the award of a Ph.D. requires submitting a thesis on a research project under a supervisor who also suggested the project for the thesis, whereas a thesis for the D.Sc. degree involves mainly the submission of a collection of papers describing the independent and original research work of a candidate. In 1947, Ramachandran went to the Cavendish Laboratory in Cambridge, England, then headed by Sir Lawrence Bragg. At Cambridge, he worked with W.A. Wooster and A. Lang on a crystallographic project and developed a mathematical theory for determining the elastic constants of crystals from measurements of diffuse X-ray reflections. He received a Ph.D. from Cambridge University in 1949. While at Cambridge, Ramachandran met Linus Pauling and was deeply influenced by his lectures on modeling studies of polypeptide chains (see Fig. 1 for a picture of them with colleagues during the 1960s). Ramachandran returned to Bangalore in 1949 and worked as an Assistant Professor in Physics until 1952. At that time, Sir A.L. Mudaliar, the vice chancellor of the University of Madras and an educator with a vision, was looking for a suitable person to start an experimental physics division at Madras and invited Sir C.V. Raman to take this position. Raman declined the invitation and recommended Ramachandran instead. Thus, in 1952, Ramachandran became a professor of physics at the University of Madras at the age of 29. The generous assistance and hospitable administrative support provided by Sir A.L. Mudaliar enabled Ramachandran to set up a fully equipped modern X-ray crystallographic laboratory at Madras. In the beginning, Ramachandran had trouble deciding which projects were worthy of attention. Pauling's lectures at Cambridge on the structure of polypeptide chains were still fresh in his mind, as were Pauling's publications on models of the α-helix and β-sheet structures. He knew that he wanted to work on biological problems, but the directions that he finally took were influenced by Professor J.D. Bernal who paid a visit to Madras during late 1952 and early 1953. Ramachandran asked Bernal for advice regarding suitable projects, and Bernal suggested that Ramachandran could work on the structure of collagen for which no satisfactory models had been proposed. Ramachandran therefore directed his attention to solving the structure of collagen. Using collagen samples from kangaroo tail tendon, and assisted by Gopinath Kartha who was his first post-doc, Ramachandran produced X-ray diffraction patterns from the collagen fibers. Using these data, and armed with relevant physicochemical data, they started building ball-and-stick models of the collagen structure. Those efforts culminated in a paper1 published in Nature in 1954 on the structure of collagen. Their proposed model for the collagen structure consisted of three parallel left-handed helical polypeptide chains standing side-by-side and packed together in a hexagonal array. Each helix had 32 symmetry, hence 3 residues per turn of the helix. Every third residue in each chain was a glycine, and all the glycines were located inside, facing the common central axis. Fig. 2 Ramachandran delivering a seminar. The photo was taken in the 1960s, when this author was a student in Ramachandrans lab. 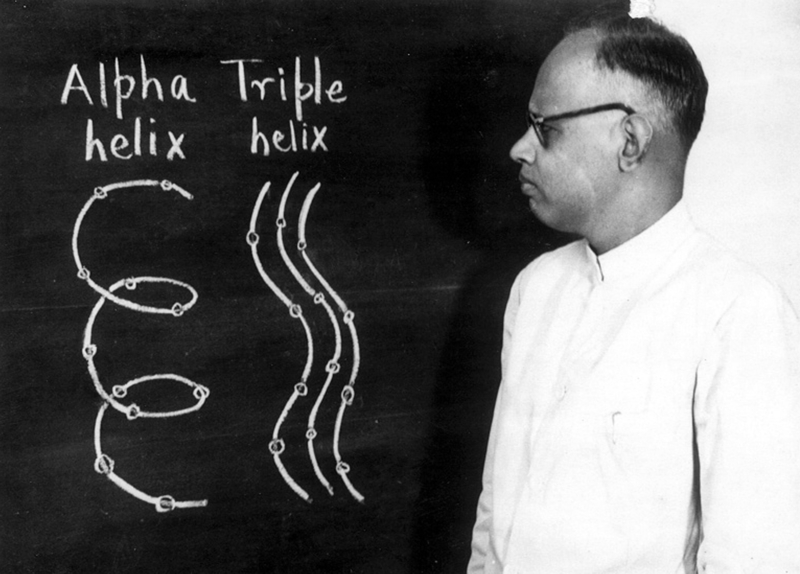 Ramachandran deliberately drew the α-helix as left-handed to drive home the message that each of the three individual helices in the adjacent figure representing the triple-helix of collagen was left-handed. He encouraged the students to imagine a single left-handed α-helix, and then to imagine stretching it along the helical axis so that the number of residues per turn became three, resulting in the conformation of an individual left-handed collagen helix. Subsequently, Ramachandran and Kartha revised the model in light of more detailed studies of the fiber diffraction patterns. In the revised model, the number of residues per turn became 3.3, so that each of the 3 parallel left-handed helical chains was made to coil around the common central axis in a right-handed way, giving rise to the now famous coiled coil structure. A paper2 presenting this revised model was published in Nature in 1955. A picture of Ramachandran presenting a model for collagen during a lecture is shown in Fig. 2. The proposed structure for collagen contained two interchain hydrogen bonds. Citing steric constraints, one of these hydrogen bonds was considered unacceptable by Alexander Rich and Francis Crick, who proposed an alternate model possessing a single interchain hydrogen bond3. Ramachandran felt that the frequent occurrence of hydroxyproline in the collagen sequence (-Gly-Pro-Hypro-) implied the need for an extra hydrogen bond, presumably through a water bridge between adjacent chains. This controversy, as to whether collagen structure had one hydrogen bond or two hydrogen bonds, raged for quite some time, but has now been resolved. Studies by Helen Berman and colleagues4 on single crystal structures of oligopeptides incorporating collagen sequences appear to indicate that there are on average 1.5 hydrogen bonds. The controversy left an unfair legacy (one often found in biochemistry text books), which is the tendency to discuss the triplehelical structure of collagen without giving due credit to Ramachandran. In a recent email to this author, paying tribute to Ramachandran, Pauline Harrison (Sheffield, UK) wrote: "... I think that he did not get as much credit as he deserved for the collagen structure". One hopes that the future generations will set the record straight. Nevertheless, the controversy had a fortunate silver lining to it, and protein science was the beneficiary. The controversy hinged on the minimum nonbonded distance between atoms. Ramachandran therefore set his associates to work on a survey of all crystal structures, especially of amino acids and peptides, for close contacts involving C, N, O and H atoms. The survey revealed that nonbonded atoms, in fact, approached each other much more closely than the sum of their respective van der Waals radii would indicate was possible. Ramachandran and his associates thus arrived at a set of contact distances, called the 'normal limits', for each pair of atoms. Ramachandran also found that in order to accommodate Pauling's α-helix, the normal limits had to be further reduced by 0.1 Å, to yield the so-called 'extreme limits'. Ramchandran applied these limiting distances to another problem - whether a polypeptide chain's conformations may be restricted because the chain's backbone is essentially made of rigid planar peptide units. Since two successive peptide units are hinged at the Cα atom, a pair of peptide units has only two degrees of freedom (rotations φ and ψ) around the bonds linking each Cα atom to the neighboring peptide units. It was a brilliant flash of insight for Ramachandran to treat this as a mathematical problem of rotation of two rigid planes containing interacting hard spheres that must avoid bumping against each other. Using the contact limits, if the rotations result in sterically unacceptable contacts, such conformations are considered disallowed. This reasoning was the genesis of the Ramachandran plot. As the finer details of the map were being worked out, the first crystal structure of a protein (that of myoglobin) became available, and a check of the observed φ and ψ values for the protein chain resoundingly confirmed the correctness of the Ramachandran map. The first international publication5 giving details of the map appeared in 1963. An exhaustive 155-page review article appeared subsequently6. R.E. Dickerson was among the first to epitomize the beauty and importance of Ramachandran plot in his 1969 monograph7 entitled The structure and action of proteins, which was written with Irving Geis. Recently, in an email message to this author, Janet Thornton wrote: '... I have never met Professor Ramachandran, but his contribution ... rank(s) with Pauling's discovery of the α-helix. It never fails to excite me, when I see the Ramachandran plot and realize how much of the beauty and order of protein structures is encapsulated by this plot. I also think that this major discovery highlights the importance of clear thought and vision that do not always need expensiveequipment and huge teams of people'. No one could have said it better. 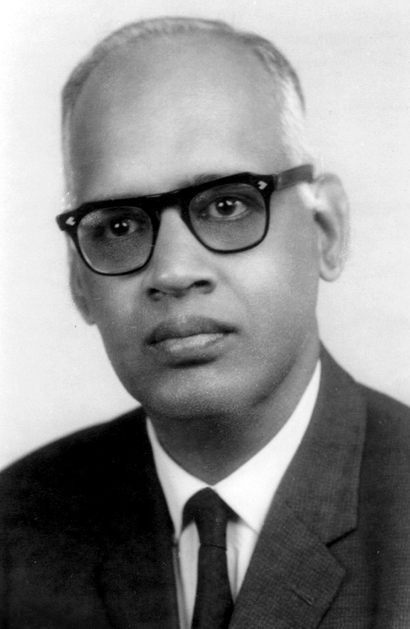 In the late 1950s and 1960s, Ramachandran also worked on several aspects of crystallography, such as phase determination in the presence of anomalous dispersion, probability distribution of X-ray intensities, crystallographic statistics, and so forth, and he devised the correct formula for calculating the X-ray phase angles using Bijvoet differences (which occur when anomalous scattering of X-rays is present). He also wrote and edited several books and monographs dealing with crystallography and biopolymer conformations. In addition, he organized several international conferences on the conformation of biopolymers, which were often referred to as the 'Madras conferences' and were attended by many of the luminaries in structural biology of the day, including several Nobel laureates. Ramachandran resigned from Madras in 1970 and spent a year as visiting professor at the Biophysics Department of the University of Chicago. During this visit, he devised a new method involving convolution to reconstruct three-dimensional images from two-dimensional data, thus laying the foundations for computerized tomography. 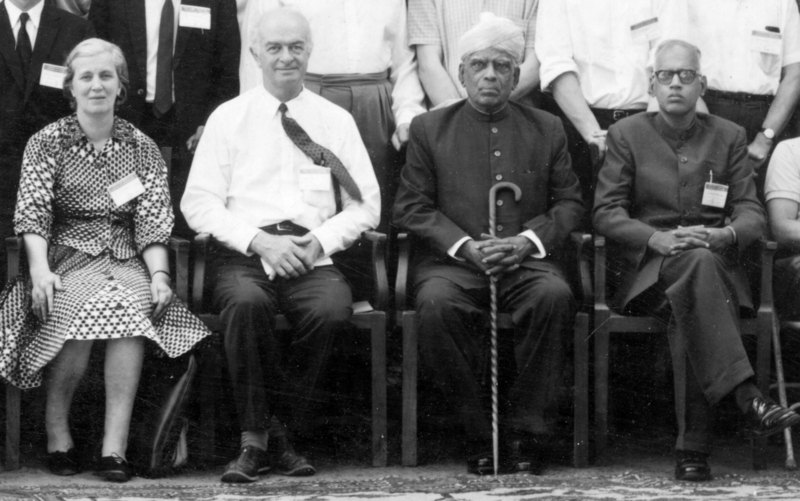 On his return from Chicago, Ramachandran joined the Indian Institute of Science at Bangalore where he founded the Molecular Biophysics Unit (MBU) in 1971. In 1977, he visited the NIH in Bethesda, Maryland, USA as a Fogarty scholar. In the same year, he was elected a Fellow of the Royal Society, London. He retired from MBU in 1978 but continued as a Professor of Mathematical Philosophy at the Institute until 1989. In the early 1980s, Ramachandran started showing symptoms of Parkinson's disease, and his health was deteriorating. He retired in 1989. The ailing Ramachandran was cared for by his wife Rajam whom he married in 1945. However, in July 1998, Rajam died from a heart attack, and Ramachandran never fully recovered from this blow. The only high point of this period occurred in August, 1999, when the International Union of Crystallography awarded the 5th Ewald Prize to Ramachandran for his outstanding contributions to the field of crystallography. Specifically, the award was 'in the area of anomalous scattering, … in the analysis of the structure of fibers, collagen in particular, and, foremost, for his fundamental works on the macromolecular conformation and the validation of macromolecular structures by means of the Ramachandran plot'. Since August 1999, he was under nursing care in a hospital in Madras until his death due to cardiac arrest in early April, 2001. He is survived by two sons, Ramesh (Professor of Astrophysics at Harvard University) and Hari (Institute of Plasma Physics, Ahmedabad, India), and a daughter, Vijaya (Professor of Computer Science, University of Texas at Austin). Ramachandran was a man of many talents. He was interested in classical Indian and Western Music, as well as in the philosophical systems of India and the West. During his brilliant and illustrious academic career, the number of awards, medals and citations conferred on him are too numerous to be listed. As a man who breathed science, and in terms of his lasting contributions to structural biology, Ramachandran belonged to the same intellectual class as Srinivasa Ramanujan in mathematics and Subrahmanya Chandrasekhar in astrophysics. To know more about the life and times of Ramachandran, the reader is referred to Ramachandran a biography, by R. Sarma8. Ramachandran's death is a grievous loss not only to his family members but also to the Indian and international scientific community and marks the passing away of a brilliant mind with great passion for structural biology. His scientific contributions will remain as monuments to his superb intellect. 1. Ramachandran, G.N. & Kartha, G. Nature 174, 269-270 (1954). 2. Ramachandran, G.N. & Kartha, G. Nature 176, 593-595 (1955). 4. Bella, J., Eaton, M., Brodsky, B. & Berman, H.M. Science 266, 75-81 (1994). 5. Ramachandran, G.N., Sasisekharan, V. & Ramakrishnan, C. J. Mol. Biol. 7, 95-99 (1963). 6. Ramachandran, G.N. & Sasisekharan, V. Adv. Prot. Chem. 23, 283-438 (1968). 7. Dickerson, R. E. & Geis, I. The structure and action of proteins. (Benjamin/Cummings Publishing Company, Menlo Park, California; 1969). 8. Sarma, R. Ramachandran - a biography. (Adenine Press, Schenectady, New York; 1998).